Fair. 0760724113 Ships from Tennessee, usually the same or next day. 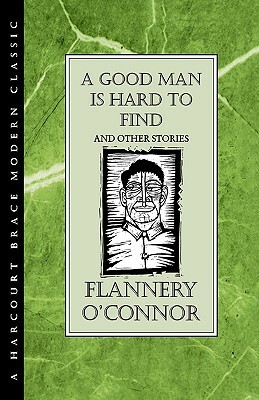 In Flannery O'Connor's title story, "A Good Man is Hard to Find," a family encounters their fate. The grandmother doesn't care to go to Florida, manipulating her son Bailey to change his plans. His wife's face is "broad and innocent as a cabbage." Their children, June Star and John Wesley, act up. Grannie hides her cat in a basket. They hit the road, where even "the meanest [trees] sparkled." The grandmother has a "leathery thin face." They stop at Red Sammy Butts' barbecue joint, where a monkey is chained to a chinaberry tree. Bailey glares at the grandmother. June Star tells the owner, "I wouldn't live in a broken-down place like this for a million bucks." Red Sammy's "stomach hung over [his trousers] like a sack of meal swaying under his shirt." The grandmother and Red Sammy lament the state of the world, referring to The Misfit, an escaped convict. "A good man is hard to find," says Red Sammy. The monkey eats a flea "as if it were a delicacy." The grandmother lies about a house's secret panel on a plantation to redirect Bailey. The cat inadvertently jumps at his shoulder, and the car rolls off the road into a ditch. The grandmother recognizes The Misfit, dooming them all. She calls him a good man, but he denies it. There are two gunshots in the woods, a wind in the trees like a "long satisfied insuck of breath." The Misfit airs his twisted theology. The grandmother has her epiphany, and the Misfit recoils like a snake from her touch. Horror ensues. The famous title story exemplifies all of the Southern writer's virtues: that peculiar mixture of the comic and the tragic, wringing hilarity from the characters' awfulness and in the grotesqueness of her physical description; the abrupt shift to violence. There are the "big symbols" O'Connor stressed to make the reader see: a town called Toomsboro, a "hearse-like" car, the malignity of nature, the monkey's primal antics. Throughout the meeting with The Misfit is prefigured; the story has about it the inevitability of ancient tragedy. At the same time the grandmother has her revelation in her disquisition with Evil; she loses the world but possibly gains her soul. O'Connor's work is among the most comic, grimmest oeuvres in all of 20th century American fiction. In this story alone, her characters include a prim, yet shameless liar, a hostile son, a clueless mother, two brats, and a killer on the road. She has the courage to make them unlikable. Her metaphors are odd and wildly imaginative, linking her characters to the vegetative world around them. One would have to reach back to Hawthorne to find so portentous a picture of the American wilderness: the "woods gaped like a dark open mouth." O'Connor's work is less baroque than Faulkner and less purely satirical than some of Welty's stories, but her stories present an utterly original vision of the American South as a fallen world of the lost. Highly recommended.